Fun fact: there’s a solar eclipse coming on August 21st that will be visible across the U.S. When I picked up He Said/She Said, a book with a giant eclipse on the cover, I had no idea an actual eclipse would be visible in my backyard the next month; I just wanted a fun thriller to round out my summer reading. But it’s a nice coincidence nonetheless, and now not only will I pay closer attention to the eclipse than I would have otherwise, thanks to this book I’ll also be looking over my shoulder because holy cow was the characters’ predicament unsettling. Laura and Kit are eclipse chasers who try to do a good thing when they witness a crime being committed at a popular viewing spot. That good thing they try to do will follow them for years and poison their entire life together. The girl they try to help, Beth, seems to want to infiltrate their lives. 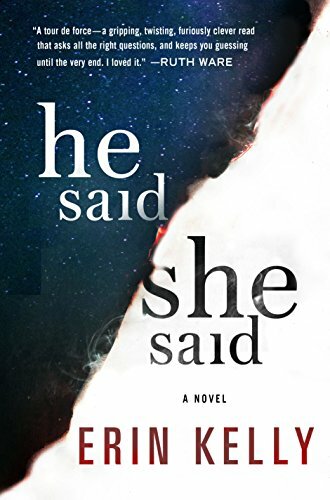 That’s what made this book so creepy to me—the idea that just by virtue of being a witness or bystander, you can get sucked into someone else’s crazy orbit from which there is no escape. Or maybe your interaction with that person will change you in ways you never thought possible. Makes me want to put my head down and never make eye contact with a stranger again! Kelly alternates both point of view and time in the narrative, which I’m sure was tricky to execute but turns the chill factor up to eleven. Kit and Laura are so desperate to leave their past with Beth behind that they legally change their names, move houses, and enact a social media blackout. Of course there’s one giant, gaping hole in their plan: Beth knows that Kit especially is an eclipse junkie, which gives her an easy way to track them down—all she has to do is follow the path of totality and eventually she’s bound to run into them again. The question is, what does she want? What really happened that night? Why won’t she just leave them alone? After all, Kit and Laura are both innocent bystanders…right? This is the best thriller I’ve read in a good long while and would be a great addition to anyone’s summer reading pile. (Apologies for the unintentional rhyme, but it gave me a tickle so I’m leaving it in because whimsy.) Also, unlike a lot of thrillers, the characters are complex enough and there’s so much gray area when it comes to right and wrong and who’s at fault that I think it would make a good book club pick. You know how some romance novelists try to convince you their heroine is strong, when all she really is is loud and opinionated? 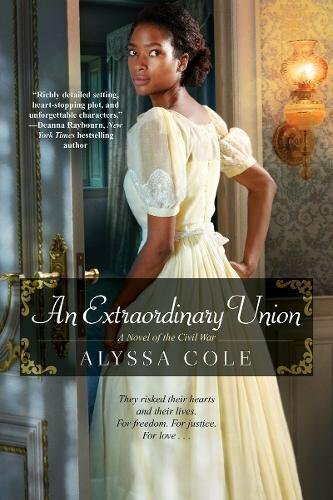 Well, Alyssa Cole knows what real strength is, and her character Elle Burns is way more than outspoken when it comes to her fight against slavery. She’s a spy for the Loyal League, posing as a slave in a Southern household and making use of her preternatural memory to glean information to help the Union cause. When she first meets Malcolm McCall, he’s in disguise as a Southern gentleman and Confederate soldier, but as a detective with Pinkerton’s Secret Service, his true purpose aligns with hers. Soon they’re working together and sharing information, and Malcolm makes it clear he wants to share a whole lot more. But Elle is understandably standoffish—getting involved with anyone could jeopardize her mission, and getting involved with a white man could mean her death. The danger and romance of Elle and Malcolm’s situation is a winning combination. One of my pet peeves in romantic fiction is manufactured conflict, but Cole doesn’t have to contrive anything here. The Civil War was a volatile time in our history, and the risk to both Elle and Malcolm is very real. It also doesn’t hurt that Cole is a sophisticated and polished writer. I loved Elle’s independence and poise. She doesn’t “need” Malcolm in the way romantic heroines often need their men—in fact, his presence in her life complicates everything exponentially. She is the consummate professional and perfectly capable of handling herself when she gets into a tight spot. She isn’t ever waiting for Malcolm to swoop in and save the day. I’ve read some great feministy romance this year, and An Extraordinary Union belongs at the top of that list.